Along with the zither and pipa, the er hu [èr hú] is a Chinese instrument that classically represents Chinese music (outside of opera). The er hu can produce a melancholy sound like no other that I know besides certain flutes. It is ideally suited for pieces that produce a sense of longing and can literally pull at your heartstrings and make you cry (which is not to say songs on the er hu can’t be very happy). It’s an extremely versatile instrument and also used in modern, contemporary music. What makes the er hu’s haunting sound is the snake skin (or python skin) which covers the drum. The rest of the instrument is basically composed of: 2 strings (made of silk or now often steel), a bow made of horsehair, pegs to tune the strings, and a body made of wood. Unlike Western music which generally uses a 12 tone scale, the er hu is used to produce many sounds in between half-tones (which is true also of traditional Indian, Arabic, Hebrew and music of other cultures) and can therefore bring out sounds that elicit varying emotions very deep within us. 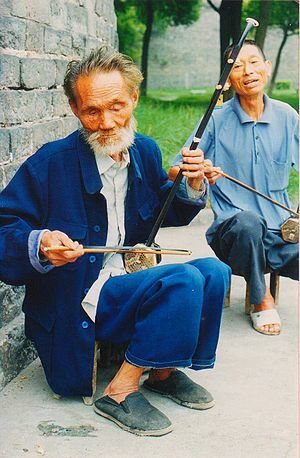 I do not know why I have seen many more men play the er hu than women (although many women do play the er hu and excellently), as opposed to the zither and, perhaps even more so, the pipa. (Perhaps men don’t like long nails?) At any rate, I have posted here two videos. The first one illustrates the classical sound of the er hu, and the second one is an exciting interpretation of a classic piece with modern elements (especially, and very delightfully, at the end of the video). This entry was posted in Art, Tradition and tagged Chinese instruments, Erhu, music, Music of China, musical instruments, string instruments by wodezitie. Bookmark the permalink. lovely instrument ….This instrument looks quite similar to a musical instrument that is used by the Rajasthani Folk artists in India… Though both of them sound quite different…. These look like traditional Musical Instruments. Am used to the digital ones. Anyway old is gold. Love what am hearing from the video. I am so glad you like it. Yes, digital certainly has so much to offer, but I feel the acoustic guitar, the simple voice, the rawness of imperfection has much more humaneness, if it can be put that way, to offer. All mediums can be brought to an artistic level, but I think if a person can master the raw instrument then you are prepared for anything that comes your way and learn to make the best out of imperfections, which, to me, is the best that art has to offer. Thank you so much for your comment! I’m glad you liked.